Its raining tablets here…ain’t it? Everyone is jumping the bandwagon. 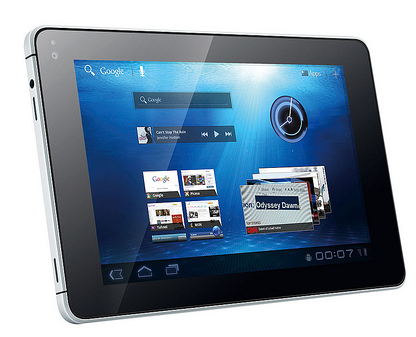 The latest is Huawei, the Chinese electronics manufacturer, today announced in Singapore launch of its Media Pad tablet. And it looks like the Media Pad does pack a punch! Huawei calls this tablet world’s smartest, slimmest, lightest, and affordable tablet in its class. Interestingly, this tablet comes with Honeycomb 3.2 and not 3.1! Media pad’s is powered by Qualcomm’s 1.2GHz Snapdragon processor and has a 7 inch capacitive display with an awesome pixel density of 217 PPI. Compare that to iPad’s 132 PPI, Galaxy Tab’s 149 PPI and Motorola Xoom’s 160 PPI! Unlike the iPad, Huawei’s Mediapad has full support for Adobe Flash 10.3. It has a HDMI output, supports 1080 full HD video and can play audio and video in all standard formats! Camera – 5-megapixel rear with HD video recording & 1.3-megapixel front facing. Ok, the prices were not announced as yet, but we know that Huawei will bring this featured packed Media Pad at attractive rates. Huawei Media Pad sure looks very interesting and feature-packed, what needs to be seen is whether Huawei delivers what it has promised!